During the mid 60's UK record companies had a very conservative attitude about signing new acts, in fact it is somewhat similar to the short sighted attitude that modern record companies have nowadays. During the mid 60's many groups were offered one or two shot singles deals that pretty much meant the newly signed group would have to hit big immediately or they were dropped. Radio in the UK was also pretty restrictive, unlike the USA which had thousands of radio stations which all played different styles. So it appears The Accent were victims of not being in the right place at the right time. I can certainly see why "Red Sky At Night" wasn't it a hit, it was much too progressive and involved to compete with most of Top 40 acts of the day. On the other hand 1967 was also the year that psychedelic heavyweights Cream & Jimi Hendrix Experience were making their marks on the popular charts so The Accent did have a chance had their record received some airplay. I don't know why it didn't because to me it is the equal of anything Cream or Hendrix were serving up at that time, the record even received as USA release as my copy on Parrot demonstrates. The only photo I have seen of The Accent they are sporting psychedelic threads that I don't think even The Moody Blues would be caught dead in. "Red Sky At Night" has a delicate acoustic intro that quickly shifts into brutal psychedelic power chords that are easily on par with the heaviest sounds of the day. The vocals are ultra bizarre giving the overall feel of the song the sound of Arthur Brown singing lead for Cream. There are also traces of Pink Floyd in the group's playing most notably Floyd's more far out numbers such as "Interstellar Overdrive" & "Take Up Thy Stethoscope And Walk." The resulting effect of the record is supreme disorientation. The flipside "Wind Of Change" takes no prisoners either, while not as strong as the A side melodically it makes up for it with true brute force. I just wonder what these guys sounded like live on stage. The Accent clearly had all the hallmarks of a fantastic and very original group, why Decca failed to cultivate their talent is anyone's guess. Both sides of this single have been compiled several times over the years on samplers such as "Chocolate Soup For Diabetics Volume 3", "Glimpses", and several of the Bam Caruso compilations so hearing both sides of this great record are not too difficult. Again one wonders what could have been had The Accent managed to get a break or two. 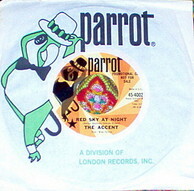 Of the former Accent members guitarist Rick Birkett issued a solo album for Mike Vernon's Blue Horizon label in 1970 under the name Rick Hayward.